Icarus loved the feeling of flight and soon forgot his father’s instructions. He rose higher and higher in the air. Wicked King Minos cast his architect Daedalus into prison. The architect had built a maze to hide the king’s minotaur, which is a terrible monster that is half human and half bull. Another king invaded the maze, killed the minotaur and stole King Minos’ daughter. King Minos was angry and blamed Daedalus. The prison was on an island surrounded by water. Daedalus tried to escape, but all the boats entering and leaving the island were searched. Daedalus decided to fly out of the prison. Daedalus built a set of wings for him and his young son, Icarus, from a wooden frame. He covered the frame with small and large feathers and secured the feathers with wax. The heat of the Sun melted the wax, just as his father had predicted. Poor Icarus fell to the sea and drowned. When it was time to fly, Daedalus told his young son not to fly too close to the sea because the dampness would clog the feathers. On the other hand, flying too close to the Sun would melt the wax. The two took off, escaping from the miserable prison. Icarus loved the feeling of flight and soon forgot his father’s instructions. He rose higher and higher in the air. The heat of the Sun melted the wax, just as his father had predicted. 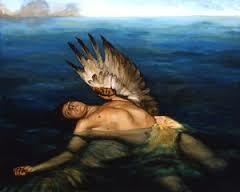 Poor Icarus fell to the sea and drowned. Daedalus was heartsick. He landed in Sicily and built a temple to the God Apollo. He hung up his wings and never flew again. A storytelling animated film about the myth of the flying story. 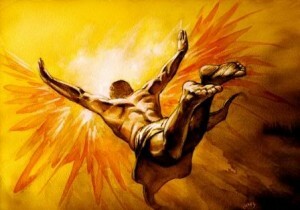 Question: Is the story of Icarus true? Answer: Greek myths didn’t necessarily happen, although parts of them might have. Enjoyed the Easy Science for Kids Website all about Daedalus and Icarus info? Take the FREE & fun all about Daedalus and Icarus quiz and download FREE Daedalus and Icarus worksheet for kids. For lengthy info click here. Declan, Tobin. " Facts About Daedalus and Icarus - Greek Myth for Kids ." Easy Science for Kids, Apr 2019. Web. 21 Apr 2019. < https://easyscienceforkids.com/all-about-daedalus-and-icarus/ >.